Here’s your exclusive first time customer special on ThermaSpice™! If you’re not happy with your product or results for any reason, we’re here to help. Simply contact our US-based customer service team within 90 days of purchase, and we’ll issue a refund – even if you’ve already used the product. That means you have the opportunity to try any SpiceFit™ product, completely risk free. ThermaSpice is derived from natural compounds, and is fantastic for anyone who wants a little extra help looking and feeling their best. 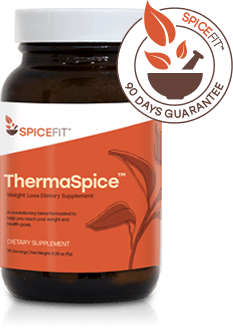 ThermaSpice is perfect for anyone with a busy, modern lifestyle who wants to slim down or stay fit, no matter what life throws their way. What are the ingredients in ThermaSpice? DygloFit™: an extract of Dichrostachys glomerata fruit. This culinary spice has long been revered for its medicinal properties in its native West Africa. In modern research, DygloFit™ has been shown to help people maintain a healthy body weight, while also providing metabolic support in the long run. That's because DygloFit™ is made from the extracts of some of nature's most powerful polyphenol compounds, ideal for supporting metabolic wellness. 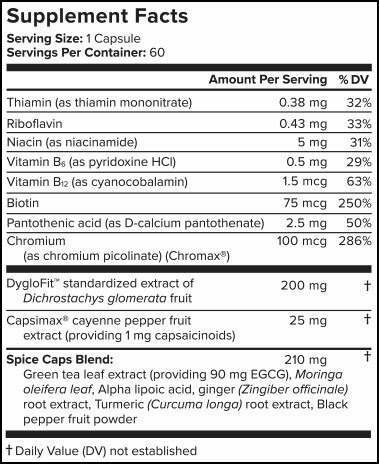 Capsimax: A compound containing capsaicin, the powerful thermogenic ingredient that gives chile peppers their hot taste. Capsaicin is thought to improve energy levels, support a healthy body composition, and promote feelings of fullness. With Capsimax, you get all the benefits of capsaicin in a patented design, to help you enjoy a slimmer physique and improved energy levels without the upset stomach or burning sensations associated with spicy food. Here at SpiceFit, we take pride in creating products that are potent, powerful, and safe. That’s why all of our products are rigorously checked for purity and potency at an independent, 3rd party facility, and made from the highest quality ingredients. How will I know ThermaSpice is working? Many people feel some of the benefits of ThermaSpice right away – benefits that include feeling more energized and leaner. But for some, it can take 30-60 days to fully notice the slimming benefits of ThermaSpice. We’re proud of ThermaSpice, so we stand behind it 100%. If you’re not happy with your results for any reason, simply contact our US-based Customer Support Team within 90 days, and we’ll refund your purchase – no questions, no hassle. This powerful blend combines cutting-edge compounds derived from nature’s most potent spices. ThermaSpice is designed to help you reach and maintain a healthy weight, so you feel strong, energized, and comfortable day in and day out. Thanks to its award-winning ingredients, ThermaSpice is the perfect tool to help anyone look and feel their best.